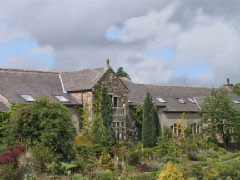 Places to stay: Aside from Greenside House B&B, those seeking accommodation in period surroundings will find a few notable options within a short drive of Caldbeck. These include The Snooty Fox which dates from 1624 and is situated in Uldale; the multi-century Boltongate Old Rectory (details at TripAdvisor) and the Boot and Shoe in Greystoke. Places to stay: Aynsome Manor is highly-regarded by many independent reviewers and offers a genuine period ambience, while the similarly celebrated Cavendish Arms is a splendid old coaching inn. 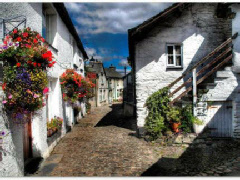 Places to stay: There are a fair number of olde-worlde hotels, inns and bed & breakfasts in Hawkshead, including The Queens Head and Ivy House Hotel. 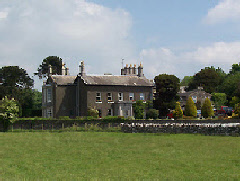 Also see our specific historic hotels page for Ann Tyson’s House. Places to stay: Although Cheshire possesses some of Britain’s most iconic half-timbered houses, few offer accommodation to the traveller. However, those wishing to explore Gawsworth and its surroundings might find what they’re looking for in nearby Congleton – The Lion and Swan offers 21st century comforts in a 16th century building, while The Plough is a 17th century inn (although accommodation is in a more recent annexe). Also, a little further away but still within easy reach is The Wizard’s Thatch at Alderley Edge – the recipient of numerous excellent reviews. Places to stay: The closest period hotel to Great Budworth is almost certainly Wincham Hall (of which only part of the original property remains). Places to stay: Formerly a farm and now a country house hotel, Gibbon Bridge offers four-star hospitality in Chipping itself. Also nearby is the Inn at Whitewell (details to be found at TripAdvisor) whose origins date back as far as the 14th century. Places to stay: The best options for those seeking period hotels or inns near Downham is to be found in and around Clitheroe (less than 5 miles to the south west).